Comedian Catherine Tate is to play Doctor Who's new companion, reprising her role from the 2006 Christmas special, the BBC has announced. She will join David Tennant for the complete 13-week run of the new series of Doctor Who, which is due to begin filming in Cardiff later this month. Freema Agyeman, who played the Doctor's companion Martha Jones in the third series, will return mid-series. Kylie Minogue will also be starring in this year's Christmas special. 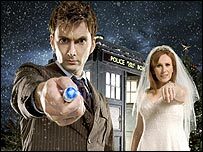 Tate will be returning to her role as Donna, the runaway bride who found herself transported into the Tardis as she prepared for her wedding on Christmas Eve. The episode, broadcast on BBC One on Christmas Day, attracted an audience of 9.4 million. Donna was invited by the Doctor to travel with him at the end of the episode, but the invitation was declined at the time. Tate was asked if she would like to become the Doctor's new companion at the press screening of the Christmas episode to which she replied, "I would love to, but no one has asked!" Doctor Who's executive producer and head writer, Russell T Davies described Tate as an "absolute star" in The Runaway Bride episode. "We are delighted that one of Britain's greatest talents has agreed to join us for the fourth series," he said. Why does everything have to become a celebrity fest? Catherine Tate said: "I am delighted to be returning to Doctor Who. "I had a blast last Christmas and look forward to travelling again through time and space with that nice man from Gallifrey." Agyeman, 28, is to play Martha Jones in three episodes of spin-off show Torchwood, which producers have said will "expand" her character. She replaced Billie Piper, who left at the end of the second series. The fourth series of Doctor Who is due to debut on BBC One in Spring 2008. A Christmas special starring David Tennant and Kylie Minogue will be screened on Christmas Day 2007. What do you think of Catherine Tate being Doctor Who's new assistant?